If you’re looking for a way to enhance the beauty, appeal, comfort and value of your home, take a closer look at Ultra-Lattice. We think you’ll agree that it’s definitely more than a cut above any other option you may find. The look of wood. Ultra-Lattice offers the thickest gauge aluminum lattice rails the industry – 30% thicker than other products. This allows deep embossing that captures the true texture and look of perfectly cut, premium grade wood. The added thickness also provides superior strength and durability. See your home in a whole new light. Partial shade. More shade. The tremendous flexibility of Ultra-Lattice lets you select the amount of shade your structure provides, from 30% to 60% to total shade. You can even combine them so you get the comfort you want, while your plants get all the sunlight and rainfall they need. Total comfort, rain or shine. In areas of intense rain or sun, solid covers offer complete shade and total protection for all or part of your patio. Our insulated roof panels blend perfectly with the latticework and help achieve the degree of protection that’s right for you. Is it wood, or is it aluminum? With Ultra-Lattice’s realistic driftwood finish, it’s hard to tell. But the difference will be amazingly clear to you years later, when – unlike wood – your Ultra-Lattice is never in need of paint or repair. A beautiful investment. Whether you’re improving the appeal of an existing patio, or converting a corner of your property into a cozy backyard retreat, Ultra-Lattice helps you protect and enhance your home’s value by making it more beautiful, comfortable. An extension – not an add-on. 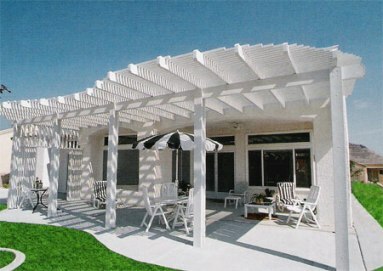 The most visually pleasing lattice covers are those that integrate with the design of your house. Our wide range of colors, rafter cuts and other options enable you to find a solution that provides a complement to your home – not a contrast. Beauty that outlasts wood. Both wood and Ultra-Lattice look great immediately after they’re installed. But very soon after, your wood lattice is likely to need painting or repairs – while Ultra-Lattice literally looks as good as new. What makes Ultra-Lattice different from other aluminum exterior products? It’s coated with Kynar 500 – an ultra-tough, stain-resistant resin that withstands the rigors of time and nature like no other finish. It has an unsurpassed ability to retain its color and gloss, so that your lattice pergola retains its vibrancy and beauty for years to come.